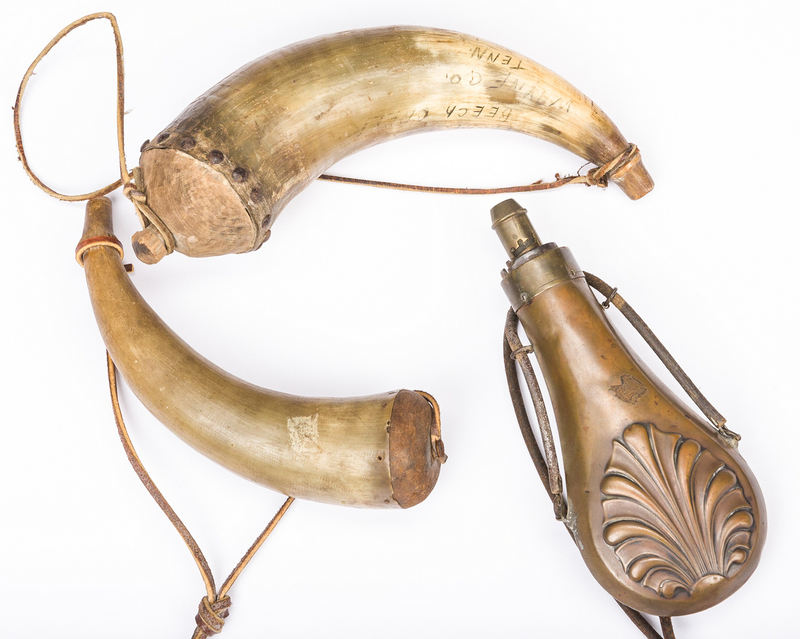 Two (2) powder horns, including one (1) signed, and one (1) powder flask, 3 items total. 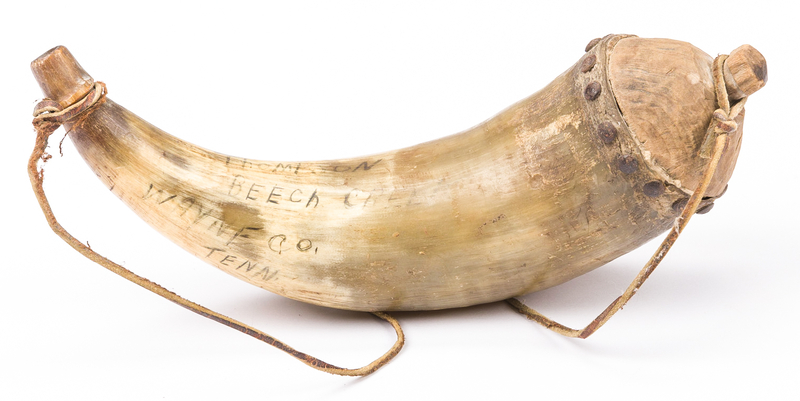 1st item: Signed Wayne County, Tennessee powder horn, incised on the body "Thompson/Beech Creek/Wayne Co./Tenn.". 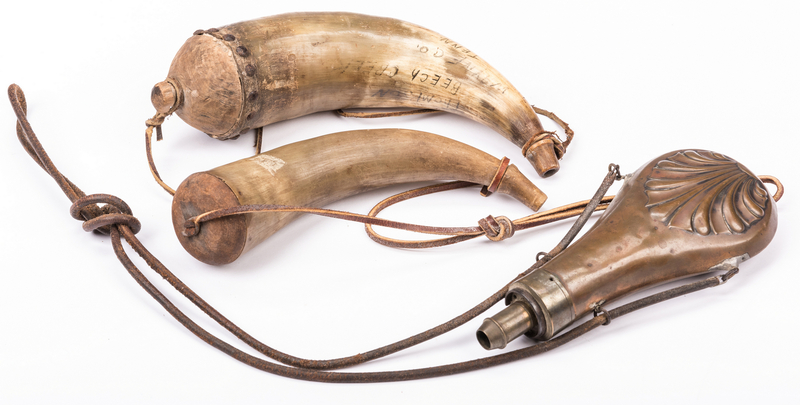 Round wooden plug end secured by brads, leather strap attached to plug finial and nozzle. 8 1/4" outer circumference of longest curve. 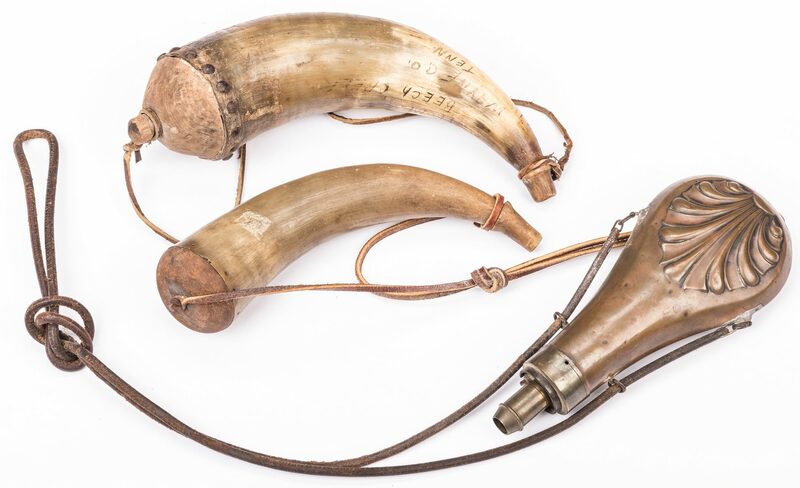 Note: Horn might have belonged to Jesse Thompson, an early settler of Wayne County, or a relation including Asberry Thompson, Second Lieutenant, Company E of the Tenth Regiment Tennessee Volunteer Infantry, Union Army. (Information according to "Goodspeeds History of Wayne County, Tennessee 1886", http://www.tngenweb.org/wayne/history.htm). 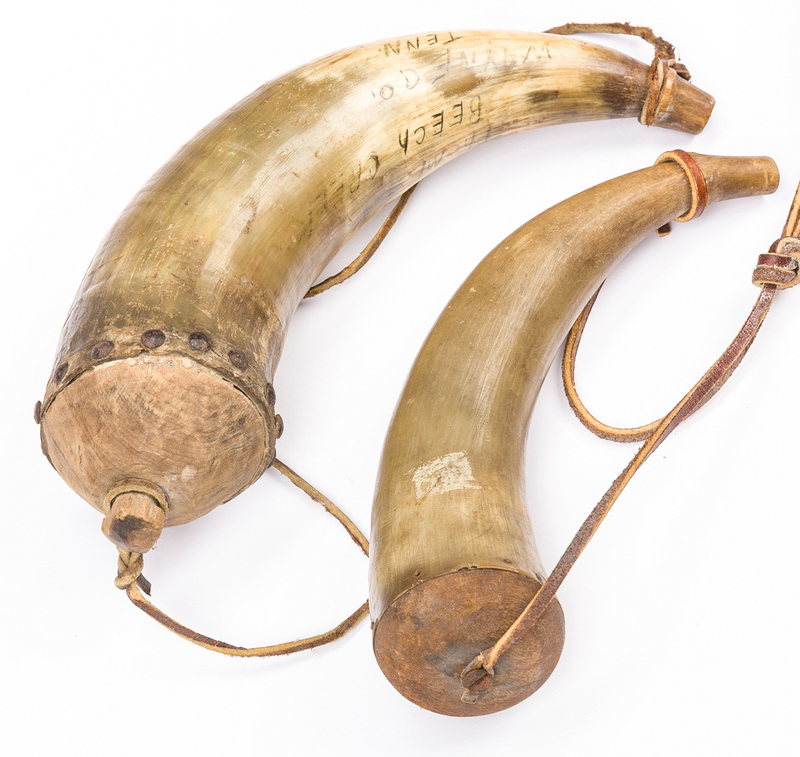 2nd item: American powder horn. 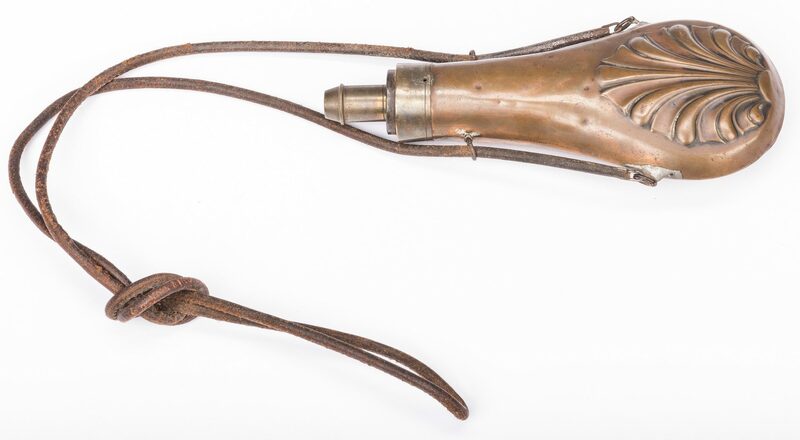 Round wooden plug end secured by brads, leather strap attached to nail and nozzle. 6 1/2" outer circumference of longest curve. 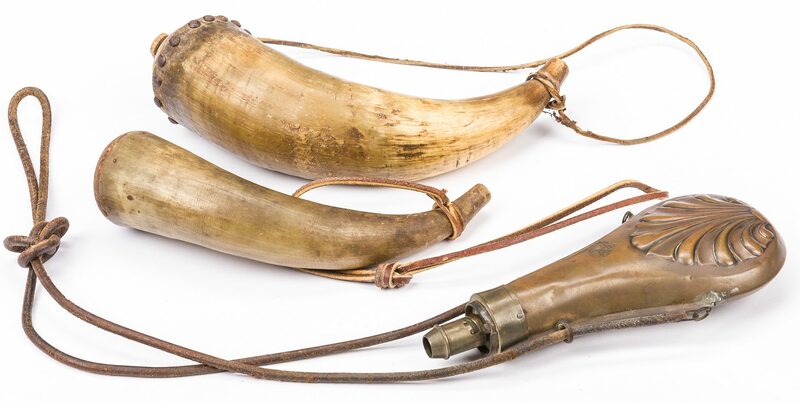 3rd item: American or English brass powder flask with embossed shell design and leather cord strap. 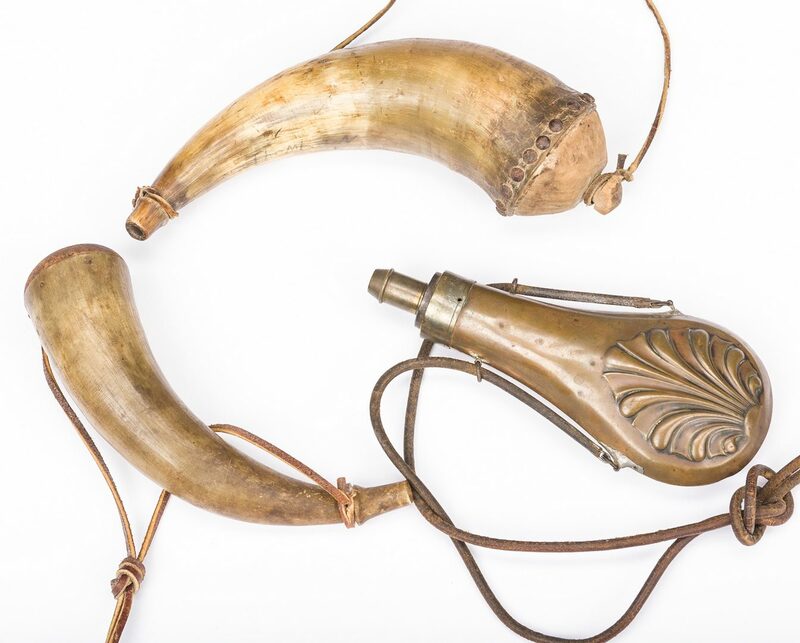 Flask – 8" L. Overall – 22" L. Early/mid 19th century. Provenance: Private Knox County, TN collection. CONDITION: 1st item: Overall good condition. Cap is missing. 5/8" area of loss resulting in minute hole, surface of plug end. 2nd item: Overall good condition. Cap is missing. 5/8" x 3/4" sticker residue, surface of horn near end cap. 3rd item: Overall good condition with surface dents to be expected from age and manner of use. Areas of oxidation, surface of flask. 1/2" square sticker residue, surface of flask above shell design.